A hamster named Pebbles is the latest victim in the ongoing battle between airlines and passengers who want to travel with their “emotional support” animals. Pebbles’ owner Belen Aldecosea was scheduled to fly from Baltimore to her home in Florida on Spirit Airlines. When she booked her reservation, Aldecosea said she was assured by a Spirit Airlines representative that she could bring the hamster on board with her. But when the 21-year-old arrived at BWI for her flight, she was told Pebbles was not welcome. And then, Aldecosea told the Miami Herald, things took a turn for the worse. 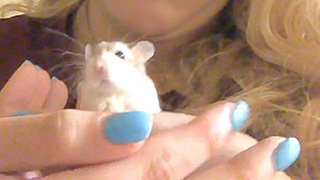 Unable to bring the hamster with her but needing to get home to deal with a medical issue, Aldecosea said an airline representative suggested two options: she either set Pebbles free outdoors or flush her down the toilet. The woman claims she spent hours scrambling to find another way to get home, including trying to rent a car, but says none were available. The result: a desperate Aldecosea said she flushed Pebbles down an airport toilet. A spokesperson for NK confirmed that an employee incorrectly told Aldecosea that she could bring her hamster on the flight, but denied that Aldecosea was advised to flush the hamster or harm her in any way. Aldecosea is now considering suing.